Chandigarh, Kulbir SIngh Kalsi:-“Chaar Sahibzade” movie is landmark in history of religious, animated movies.Makers of “Chaar Sahibzaade” movie – Baweja clan was honoured at Punjab Kala Bhawan by Punjab Arts Council for their immense contribution towards reliving the era of Sikhism showing the sacrifices of tenth Sikh Guru Gobind Singh Ji’s four sons. Director Harry Baweja and Producer Pammi Baweja for creating Chaar Sahibzade were honoured here. This movie is reminiscent of the chivalry of the four sons of Guru Gobind Singh who have sacrificed for the nation. 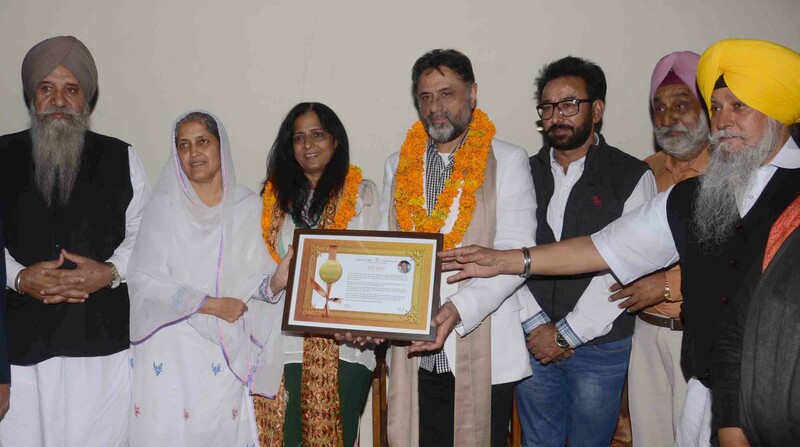 They were honoured by Chairperson Bibi Harjinder Kaur, Vice Chairman Er. S S Virdi and Secretary General Dr. Nirmal Datt along with Sh. Sudesh Sharma Secretary Punjab Sangeet Natak Akademi and Dr. Sadhna Sangar Secretary Punjab Lalit Kala Akademi.